Recently a LAUDA-Noah Model 3500 Point-Of-Use™ chiller was installed on a Lam 2300 Versys™ chamber for a temperature and CD repeatability evaluation. A LAUDA-Noah point-of-use chiller is located very close to the etch chamber and it operates with a small volume of dielectric fluid. Combined with its dynamic control architecture it responds immediately to changes in heat load, providing temperature control that can maintain set-point within a much tighter tolerance. We evaluated the temperature repeatability of our Poly Gate etch chamber with the point-of-use chiller vs. an identical chamber with a traditional compressor-based reservoir type chiller. We measured temperature repeatability with the OnWAFER device and CD repeatability with Known Good Wafers (KGW) from the Poly Gate etch. The evaluation was begun by running an OnWafer four times in a row. 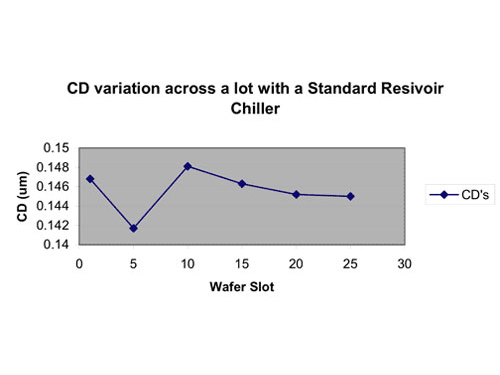 The data is given below along with the reservoir chiller data for comparison. We can see from this test the POU chiller has much better temperature repeatability than the reservoir chiller. It is interesting how both chillers end up in the same place over time. The POU chiller is stable from the start, while the reservoir chiller ramps up then down. Next, CD variation was measured across a lot for both cases. The Known Good Wafers from the Poly Gate etch were used for these tests. The results are shown below. 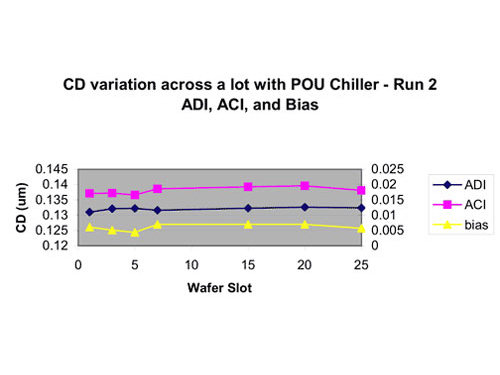 We can see that the variation in the POU chiller case is much less, with only 3nm variation vs. a 6nm variation with the conventional chiller. Graphs of this data are shown below. Again, these graphs show the POU chiller to be much more stable than the reservoir chiller. 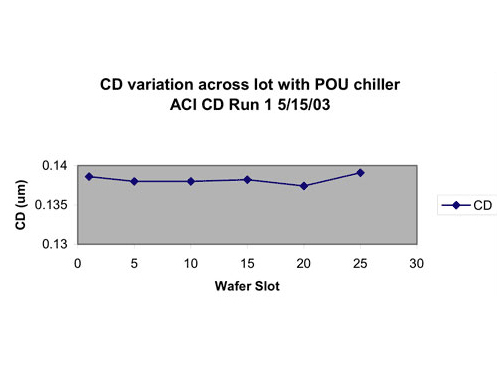 To check the stability of the POU chiller over time another across wafer CD tests was run a week after the first one. That data is shown below. Again much lower variation in the POU case, But what is really striking is the CD repeatability lot to lot. The average for the first lot was .13822µm, the average for the second lot is .13823µm. Nice repeatability. The LAUDA-Noah Point-of-Use™ thermoelectric chiller has demonstrated a significant improvement in CD Bias control. There is considerable benefit to be realized by implementation in the production environment for processes that are temperature sensitive, similar to the Poly gate etch tested in this evaluation.